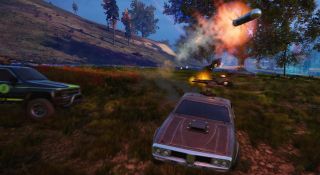 Chris Livingston played a battle royale with cars, and the weirdest thing about this is it's not the only game in what should be a very niche subgenre. Notmycar is still in Early Access and certainly sounds like it, with plenty of network problems. Maybe one to wait on. Meanwhile, Tyler Wilde has been playing Slay the Spire (which came out of Early Access this year), and experiencing the thrill of failing at the final hurdle. He raises the point that permadeath games often lose people because they make us repeat the opening, but in Slay the Spire that didn't bother him. It's certainly won over a lot of us. Alex Wiltshire has gone back to The Stanley Parable, and ruminated on things like the importance of its Narrator. Without his perfect tone, the broom closet bit would not be nearly as funny. He also highlights the level design, which has to both steer you and highlight all the ways it's steering you at the same time. Clever stuff. Lauren Morton's still playing Outward, and enjoying the fact that it doesn't have a minimap. Even the full-size map isn't 100 percent reliable, so she's been learning her way via landmarks instead, which is a much more satisfying way to play. Tom Senior's been trying to get into Elite: Dangerous but finding it hard to get over the initial hump. It's a common complaint, but he's dedicated the weekend to giving it another shot so let's wish him luck in that endeavour. I'm replaying the Borderlands games, in particular the first one thanks to its Enhanced edition. While not my favorite of the series it's still a good time, and I've been playing with both my high-level siren and a brand new soldier. One thing I'd forgotten is how much easier it is to kill enemies by running them over in the first game—it's almost always a one-hit kill, and the best way to deal with all the skags in the opening areas. Enough about us. What about you? Has anyone been trying the PC port of the Ace Attorney Trilogy? Or are you still into Sekiro? Or a replay of Vampire: The Masquerade—Bloodlines? Let us know!